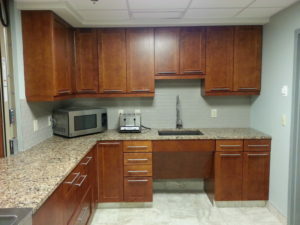 Cabinets and shelving are an important part of a building’s aesthetics and functionality. Contractors must analyze the best materials to use for any given application. Modern cabinetry is typically built with some form of plywood. The term “plywood” is defined as a panel manufactured with three or more layers (plies) of wood or wood products (veneers or overlays like plastic laminate and/or core materials), generally laminated into a single sheet (panel). Plywood panels provide exceptional strength and stability, and are well suited for processing using modern machinery. An important characteristic of core performance is the “flatness” and “dimensional stability.” Consider these options for panel core products, including medium density fiberboard (MDF), particleboard, and veneer core. All core materials mentioned here – plywood, medium density fiberboard (MDF), particleboard, and veneer core – may be used as cores for the application for decorative faces (e.g. veneer, plastic laminate, and wood) to the face and back. Follow the link to read more about decorative faces. Sometimes referenced as composite core, Medium Density Fiberboard (MDF) is made of wood particles reduced to fibers in a moderate pressure-steamed vessel, combined with a resin (typically urea-formaldehyde), and bonded together under heat and pressure. MDF is the flattest option for core materials, and is used for high end veneers where you want the smoothest possible surface. You can purchase MDF with a wood veneer, melamine facing, or as a paintable panel (if you do plan to paint, first seal the edges as they are highly absorbent). This would be our choice for a veneered conference room table or blueprint matched veneer cabinet doors. Industrial Grade Particle Board, sometimes referenced as composite core, is made of wood particles of various sizes that are bonded together with a synthetic resin or binder under heat or pressure. Industrial Grade Medium Density Particleboard is our most commonly used core material. It’s flatter than veneer core, lighter than MDF with superior screw holding, and the most economical choice. To be clear, when this product is used as panels without surface plies, it is referred to as particleboard. When used as an inner core with outer wood veneers, the panel is referred to as particle core plywood. Industrial particleboard is classified by “density” – the weight per cubic foot of the panel product. Medium density (M series) is generally between 40-50 lbs per sq ft3 (640-800 kg per m3). In most cases, particleboard is our choice of core for plastic laminate or veneered panel products. What many think of as traditional “plywood,” veneer core is a panel core made up of an odd number of plies, 3 or more (except when the center is constructed of two unidirectional plies), alternating layers of veneers, all less than ¼” (6.4mm) thick, pressed and glued into a single sheet. Although not as flat as composite cores, veneer core is the strongest, lightest option for cabinetry. However, it is never recommended for doors, and it’s also the most expensive option. At Beaver Creek Industries, we partner with general contractors, architects, and project owners to ensure the interior of your building is as impressive as the exterior. The image above of the cabinetry we built for the Edna Tina Wilson Living Center was designed by Spectrum Design Group. If you’re interested in completing projects on time and within budget, we’d love to partner with you as part of your design team. Contact us to start a conversation about feasibility, potential return for your business, and to see if our architectural woodwork services are the best fit for your next project.